Late last month, Isaac Schick, 21, knocked on the home of Bart Charles on Bel Air Place in Paso Robles. Schick then informed the man who opened the door that he was conducting a poll on behalf of the Justin Fareed for Congress campaign. When Schick got to the sidewalk, he pulled out his phone and felt a fist on his back. 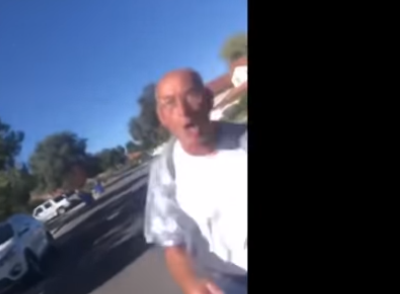 The man then continued to chase Schick, stopping after he noticed he was being recorded. “Because you’re lying,” the man said in response to Schick asking him why he was attacking him. Fareed’s campaign has denounced the violence and blamed it on members of the Democratic leadership. Schick reported the alleged assault to the Paso Robles Police department. An investigation is ongoing. Schick said. Academy award winning acting staged by Fareed’s camp? And in the news that really matters department…. The deficit literally doesn’t matter. This is how the economy works. The money will never be paid back, can never be paid back, and is never meant to be paid back. All money is issued as a loan at interest. It is mathematically impossible to pay it back. Money IS debt. Our power doesn’t come from money, it comes from our military. This idea of a balanced budget is an old classical liberal talking point that hasn’t mattered since the Vietnam war. I’m not saying local towns etc should over spend or anything like that, the peasants are on different rules, I’m talking about the money supply at the highest level. Would have been funny if the kid had laid Bart out with a nice right cross after this “heinous assault” but, if a smack to his back made him run I see why the bully chased him! I think we should all knock on his door to ask his support for Trump and really watch him stroke out. So you want to send a crowd to a persons home in order to cause harm, a stroke? What a shining example, perhaps those proud boys will help you. First off Liberal , you folks started this , by getting in peoples face who are GOP members why is ok for the gems to act like jerks, .. you went to the guy’s door , my advise son grow a pair and deal with it..
Must be a lie; there are no liberals north of the grade. Gentrification in Paso Robles has brought an influx of yuppie wino liberals. This Bart creature, however, looks like a retired gubmint employee on a phat pension was overpaid and underworked back in the day. Prolly listens to Democracy Now on 91.3 FM every morning and watches Rachel Maddow in the evenings. The liberals were also against abolishing slavery. Sure, among their southern gentleman circles one might think those good old boys were the conservatives but continued control over others was their treasured strong hold, just like today’s support for more government, regulatory agencies, etc. You are going to need to go to bretbart to get traction on that silly but sad comment. Best example of civil discourse I’ve ever seen…………. How could this leftist nutcase afford to live next to the Paso Robles Country Club on Bel Air Place? That would be because contrary to popular legend the Leftist are the ones with the real money. What you see on yahoo, the news, and the rest of the brainwashing in the way of the poor left is 1% they lure into controlled poverty,you know the freeloaders, the Antifa peace makers, the lazy,the entitlement snowflake society.Those are designed to make the world think the right side is the greedy rich bunch who control everyone’s destiny. You can pretend to call SLO co 50/50 politically all you want, but the truth is its the next closest thing to San Francisco there is.